Free Sync2 Cloud - Synchronize Microsoft Outlook data with different sources. Sync Outlook with Google, iCloud, Office 365. Synchronize Microsoft Outlook data with multiple sources: iCloud (iPhone, iPad) , Google (Gmail, Android), Microsoft Exchange (Office 365). 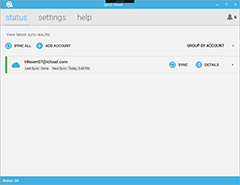 Sync Outlook data with different sources: Google, Android, iCloud, iPhone, Microsoft Exchange or Office 365 accounts. If you are looking for the quickest and simplest way of synchronizing your Microsoft Outlook Contacts, Calendar and Task folders with Google, Microsoft Exchange, Office 365 or iCloud - Sync2 Cloud is the best solution for you. You just need to install Sync2 Cloud on your computer running Outlook 2007, 2010, 2013, 2016, 2019 and after a few steps you will be ready to synchronize your Outlook folders with single or multiple* sources. All changes that you make on your Microsoft Outlook will be automatically* synchronized to all the sources you have selected. Sync2 Cloud allows you to choose between one or two-way synchronization options. *Automatic sync, unlimited manual syncs and sync between multiple accounts and services are available only with Pro version of Sync2 Cloud. Sync Microsoft Outlook with iCloud, iPhone, iPad. Synchronize your Microsoft Outlook Calendar, Contacts and Tasks with iCloud. Choose between One-way or two-way synchronization with ability to filter data by separate folders. Sync Microsoft Outlook with Microsoft Exchange. Synchronize Microsoft Exchange Calendar, Contacts and Tasks with Microsoft Outlook. Sync Microsoft Outlook with Microsoft Office 365. Synchronize Microsoft Office 365 with Microsoft Outlook. Sync Office 365 Calendar, Contacts and Tasks without creating duplicates. Use Sync2 Cloud to prevent creating any duplicate items while synchronizing your data. Sync Google with Microsoft Outlook. Synchronize your Microsoft Outlook Calendar, Contacts and Tasks with Google. Choose between one- or two-way sync. Event-based synchronization, only changes are transferred! Sync2 Cloud will detect and transfer only the latest changes made. This makes all subsequent synchronizations finish in a few seconds. Sync2 Cloud interface is very simple and user-friendly. We designed it so that anyone could use it. No IT specialist is needed. Safe PST Backup for Microsoft Outlook" Safe PST Backup for Microsoft Outlook Personal Backup Outlook software. Backup Exchange folders and PST files using Safe PST Backup. Back up Email, Contacts, Calendars or other folders. Create Microsoft Outlook PST backup email archive automatically. Sync Outlook between multiple PCs. Sync2 for Microsoft Outlook Sync Outlook between multiple PCs. Sync Outlook with Google Calendar and Gmail Contacts.